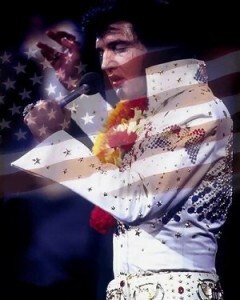 Elvis voice of the Century. Sings Like Mario Lanza. Elvis Voice Baritone Tenor. Most often asked question is why is Elvis Presley voice so unique? Elvis’ voice was the sound of an extraordinary singer with a range of more than two octaves, beautiful control with a tone, vibrato that crossed musical genres with ease and perfection. 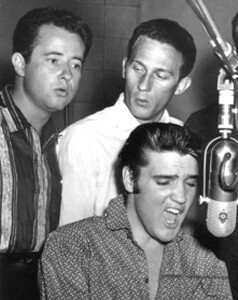 Music folks often talk of Elvis Presley’s voice range and power. Elvis was a baritone with tenor qualities and the ability of hitting the high notes. What makes Elvis voice unique from his contempories is his ability to across several genres. Example: In Heartbreak Hotel: The Life And Music Of Elvis Presley, Robert Matthew-Walker says: “Presley’s vocal range was exceptional for an untrained singer. It ranged from Low F in the bass register to top B Flat and B in the tenor range. This is over two octaves: most people can only managed just over one octave. Presley’s voice and range remained with him throughout his life, a fact proved by his recordings… Elvis could sing majestically in any style, be it rock n roll, country, gospel, country and western, R&B and even Christmas carols – because he sang from the heart with soul. And it is precisely voice qualities that has made made Elvis Presley the greatest singer in the history of popular music. Mario Lanza on the other hand with his hugely popular “bel canto” classically trained tenor voice infused with Elvis’ Southern roots created the core of his singing style. Elvis’ most important musical influence has to be Dean Martin. Opera singer Kiri Te Kanawa told Michael Parkinson that: Elvis had the greatest voice she had ever heard. One of the hallmarks of Elvis’ vocal range is the ability to move seamlessly between his tenor and baritone voices. Combined with his range, he has great control over the placement of the voice in the different resonant centres such as the chest, head and the pharynx at the back of the mouth which affects the vocal tone. The Rock classic Jailhouse Rock features a distorted high tenor vocal combined with sloppy lyrical articulation in an explosive performance. In contrast with the pure, clean tone of Elvis’ 1960 rendition of the gospel classic Where Could I Go But To The Lord with a blend of resonance between the chest and head voices is clearly apparent. Whereas, Can’t Help Falling in Love Elvis explores the richness of his baritone range moving to a gorgeous light baritone in the bridge of the song. With Guitar Man Elvis offers “speak-singing” approach described by bass baritone Paul Robeson as a singer’s “technical holy grail”. 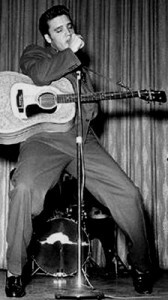 Elvis had a brilliant ability to control the attack and ending of each note. This is consistant with Elvis’ Southern accent which denotes emphises on both the first and last letters of the spoke word. Liken to the way he pronounced Graceland – it was always “Grace-ld” In the recording of Blue Moon of Kentucky we can hear Elvis using a technique known as “glottal onset and offset” in which the vocal folds in the larynx are closed at the start of a note and closed with extra emphasis at the end of the note.